St. Paul, Minn. (May 2017)--According to the Food and Agriculture Organization of the United Nations, the global demand for food, feed, and fiber is expected to double by 2050, despite the emerging challenges of extreme weather events, unsustainable fertilizer inputs, decreasing farmland, and plateauing crop yields. In July 2015, a group of leading scientists converged on Washington, D.C., to confront these challenges and demands. From this meeting, a new science discipline was solidified, one that focuses on finding new and sustainable crop production practices by researching the thousands of potential interactions within the plant’s biome, or ecosystem. The name of this new area of study: phytobiomes. Phytobiomes (apsjournals.apsnet.org/toc/pbiomes/current), a groundbreaking new journal launched by The American Phytopathological Society, was developed to be the premier research conduit for this important new discipline of the same name. The fundamental and translational research from this fully open-access journal is expected to provide the basis for many next-generation approaches to sustainable crop production by reporting on all manner of interactions between the plants, their environment, and the complex communities of organisms influencing their health and productivity. Phytobiomes publishes high-quality research papers, review articles, perspectives, resource announcements and various short communications, particularly those that utilize or develop novel approaches to improve plant productivity spanning basic to applied research areas. Dr. Carolyn Young, the editor-in-chief of Phytobiomes, is a mycologist and plant pathologist who received her Ph.D. degree from Massey University, Palmerston North, in New Zealand. She joined the Samuel Roberts Noble Foundation in 2006 where she leads a research lab on fungal-plant interactions. Her research focuses on forage improvement The Young Laboratory studies beneficial symbionts (grass endophytes) and the plant pathogens Venturia effusa (pecan scab) and Phymatotrichopsis omnivora (cotton root rot), each of which can impact sustainable plant productivity. Projects in the Young laboratory span basic research to study the fungal-host systems and applied research utilizing endophytes to improve forage grass cultivars. Young was a member of the Phytobiomes Roadmap team and also serves on the Phytobiomes Alliance (www.phytobiomes.org). 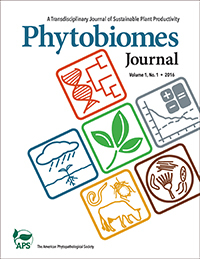 Phytobiomes (www.phytobiomesjournal.org) is a fully open access, transdisciplinary journal of sustainable plant productivity, published by The American Phytopathological Society. Phytobiomes publishes original research about organisms and communities and their interaction with plants in any ecosystem. It also provides an international platform for fundamental, translational, and integrated research that accomplishes the overarching objective of offering a new vision for agriculture in which sustainable crop productivity is achieved through a systems-level understanding of the diverse interacting components of the phytobiome. These components include plant pathogens, insects, soil, microbes, weeds, biochemistry, climate, and many others. Follow us on Twitter @PhytobiomesJ. The American Phytopathological Society (APS) announces the first issue of Phytobiomes, an open-access, cross-disciplinary journal covering ecology, climatology, plant pathology, computational biology, genetics, agronomy, entomology, animal science, and many other disciplines. Phytobiomes was developed to be the home for next-generation transdisciplinary research on sustainable plant productivity by reporting on the many combinations of interactions within the plant’s biome, or ecosystem, including those of insects, disease, weather, weeds, soils, animals, and more. NOTE: Digital artwork of the journal cover and image of Carolyn Young, the journal’s editor-in-chief, are available by contacting Phil Bogdan. Please specify if the artwork will be used for print or electronic media.